Mark products as available for pre-order/backorder in a Magento store. Add a “Pre Order” button to in-stock or out-of-stock products for any type. Notify clients when the item they pre-ordered becomes available. Mark products as available for pre-order in a Magento store. 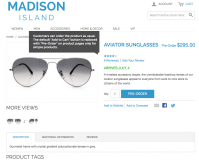 Add a “Pre Order” button to in-stock or out-of-stock products for any type. 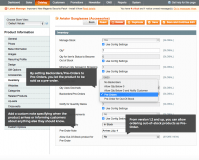 Notify clients when the item they pre-ordered becomes available. Why Use Magento Pre-Orders/Backorders extension? Let customers order much-anticipated items in advance. Notify shoppers when a pre-ordered product becomes available. Receive advance payments for pre-ordered or backordered goods. 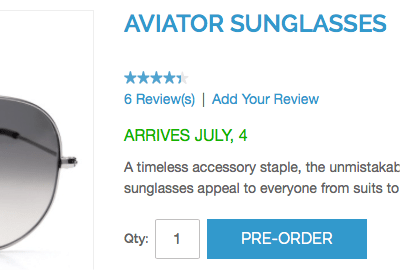 Set custom stock statuses for items in your store (for example, Arrives July, 4). When a customer places an order, a store processes it and organizes the shipment to deliver it to the buyer on time. But what if the necessary product is temporarily out-of-stock? How to handle the order then? Here’s where backorders and pre-orders come to play. Let’s find out the difference between the two in Magento. A backorder takes place when a customer made a purchase order for items that currently are not available. Having paid for it, the buyer will still have to wait until a retailer replenishes the stock. • No Backorders (selected by default). As soon as a product runs out, it becomes unavailable for purchase. • Allow Qty Below 0. Even if a product reaches 0 quantity, it remains in stock and customers still can order it. Customers won’t notice any change, as the order placement flow will remain exactly the same as for products in-stock. However, there is a disadvantage for retailers: the number of products that can be backordered is unlimited. This can cause certain challenges for inventory optimization. • Allow Qty Below 0 and Notify Customer. Works just the same as the option above, but allows to notify customers about the backorder status of an order in cart. Even though customers can place an order, there is a risk that they won’t finalize the purchase when they find out the product is being backordered. 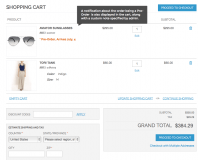 This may increase the cart abandonment rate and leave customers unsatisfied with your service. The idea of pre-orders is to allow customers to place orders for brand-new products that are not released yet. Pre-orders provide multiple benefits to retailers, as they make it possible to evaluate market demand for a new item and receive a part of revenue in advance. • Change the Add to Cart button to the Pre-Order one on the product page. • Choose the number of items available for pre-order. • Add a note for an upcoming (e.g., release date). • Sort orders by Pending Pre-Order and Processing Pre-Order statuses. Replace Buy Now with Pre Order on product & category pages. 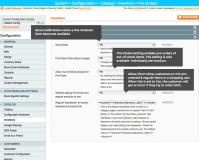 Specify when the product should become available. 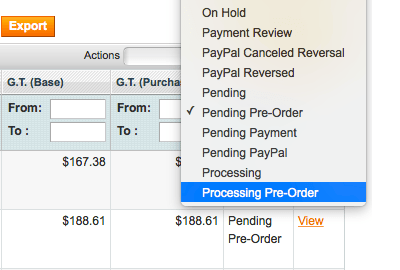 You get two new order statuses, Pending Pre-Order & Processing Pre-Order, which you can use to filter Orders. Add a custom stock status note for a product. Allow or disallow pre-orders for certain products. Limit or don’t limit pre-order quantity for certain products. Allow shoppers to pre-order in-stock or out-of-stock items. Allow to pre-order simple, configurable, virtual, bundle or grouped products. Prevent shoppers from placing regular orders & pre-orders within one session. Process Orders that contain both pre-ordered & regular items. Add a notice about an Order containing pre-ordered items to email & invoice. An order is Pending/Processing if it has both pre-ordered & regular items (unless you change this in settings). 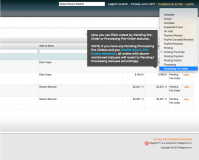 An order changes to Pending/Processing Backorder when the regular items are shipped. Regular purchase proceeds as usual; a pre-ordered item is shipped when the stock status changes to Available. Your customers can pay for pre-ordered items just the way they pay for regular items in your store. Pre-Orders extension for Magento 2 is now available! Magento Export Orders & Magento Import Orders plugin – Quickly transfer orders between different versions of Magento without any data loss or damage. Magento Custom Order Number extension – Adjust your Magento document numbering practice to your specific business workflows by setting up custom ID numbers for orders, shipping documents, invoices and credit memos. 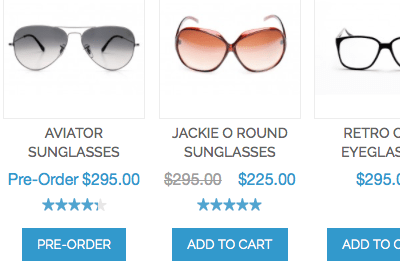 Magento Order Grid extension – Get a complete view of all orders to improve order management at your store. Recurring orderMagento extension - Make it possible for customers to create grocery lists and place recurring orders for everyday goods. * Fixed the issue with purchasing a product when it goes "Pre-Order for out of stock". * Fixed the stock status issue for custom url of admin panel. * Fixed the issue with bundle product with out of stock pre-order product option not added to cart. * Fixed an issue with purchasing pre-order out-of-stock simple product when it is a part of configurable product. * Fixed an issue with preview template of transactional e-mail. + A notice that the order contains a pre-ordered product is added into e-mail and invoice. * Fixed an issue with adding a pre-ordered product to cart once the option to deny regular and pre-order products in cart is enabled. * Fixed an issue with the Pre-Order button on a category page. * Fixed an issue with pre-order out of stock product when it is a part of grouped product. * Added new option for Backorders\Pre-orders profile in Product Stock Options - Pre-orders for Out of Stock (available for global usage). * Fixed inability to save product with enabled Pre-Orders extension in Magento CE 1.6.1.0. * Fixed the issue with Pre-Order button missing on configurable product with 1 out of stock simple product option assigned. * Fixed the issue with product status not changing to pre-order for configurable product when pre-order option is selected. * Fixed the issue with "Add to cart" button not changed to "Pre-Order" when pre-order option of configurable product is selected. * Fixed the error that happened when the default status of order is not custom set. Must-have extension for those who do not loose sales when products are out of stock. Installation takes one minute. Support is very responsive. Highly recommend to anyone. Very efficient and easy-to-use. Perfect fit if you want to have pre-orders in your store. The module is a must-have for those who want to implement a Pre-order feature in their Magento sites. 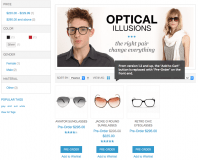 It integrates perfectly with Magento built-in inventory system. great extension and service!!! I recommend them highly. Superb Customer Service I'm in the process of building a new online store and having the ability to offer pre-orders for my customers was very important. I bought this extension and ran into problems once I'd installed it after carefully following the installation instructions. I contacted the AITOC and had a response within minutes. They contacted me to inform me that the theme I was using was causing issues and would require some investigation before they could get it working. 2 days later the extension is now working as described and has added an extra level of service for my customers. I was not charged for the extra work involved and have been extremely impressed with the professional manner the team at AITOC dealt with my issues. I cannot recommend them highly enough! Just what I was looking for, we can now get products live on our site an accept pre orders. We can also display the due date so customers are aware of the date the item will be posted. Besides the fact we can pre-sale our out-of-stock products, it has reduced a lot our chat requests, because of the information of when the product will be available again. This is an easy to use product that makes managing pre-orders very easy. I would have given it a 5 star rating if there was a setting to allow me to chose if an order with both pre-order items and in stock items was set to a Pre-Order or Processing status. If you need support with it, they have some of the best support I've seen in many years. I was online when they started processing a trouble ticket (I was upgrading from their old license system to the new one, not an issue with the product) I opened. They emailed me back and forth real time to help me solve the initial issue and a couple that I created during the process. It's hard to find support like this these days. We use this extension in our Magento and it works with some customizations that we done. We have been using the Pre-Orders extension for more than 2 years and our experience is positive. The extension came with clear instructions in PDF format. Too often developers just do not care to provide well-written instructions on how to install and use their software, making things unnecessarily difficult. This was not the case. We contacted AITOC for a licensing question and they answered quickly. After activation, we found that the extension dealt out-of-the-box with the most important aspects of pre-sales, which in our experience are: - Provide clear information to the customer. - Display different messages on different products. - Integrate with existing shop management processes (no additional things to remember). The first requirement is met by just turning the "add to cart" label on the buy button into "pre-order". The customer cannot miss it. Of course, this happens only on pre-order products. Additional text is automatically added where it makes sense, i. e. in cart. The tools to manage pre-orders are essentially two, and additional product status and an optional custom message. They both are in the product's backorder management page, so our third requirement is met. The optional message can be customized on a per-product basis, so our second requirement is also met. We have no negative aspects to highlight about this extension. The price was reasonable and it just worked. We did not test technical support but the absence of problems should be seen as a good thing! Great extension. First I miss some individual functions, but the great support add them. Aitoc support went over and above the call of duty SEVERAL times to ensure the extension worked, even tweaking the code to suit my situation. They always responded within 12 hours, and they consistently delivered. If I ran a software company I could only hope that I could provide such outstanding support. Clearly some piece of mind when you are dealing with such a nasty piece of software such as Magento where you *need* to know extensions will be future-compatible for your business to survive. Great product and great support. Found a bug, but Aitoc fixed this within a couple of hours. i bought this extension including installation. inbetween 24 hours they installed it, and it´s running smoothly and without any problems from the first second on. even they made a changement and renamed the button in german language according the EU laws. i can say only good things about this extension and about the support! simply great! Thanks a lot from Austria!! Aitoc rocks! Fantastic customer service and great modules! I recommend them highly. This extension works great for my needs! I've a store with online cd game keys. So we've allot and often pre-orders. Extension is flexible and easy to use. In the beginning there was a small problem, but AITOC helped me out fast and very good. This is also working for me. I have a store running 1.4.1.1 and was able to get it installed and working correctly. The install is a bit tricky but if you follow all of the instructions (which I didn't the first time) it should work. But I think the best thing about this extension is the support. I had an issue (I played around with the database when I shouldn't have) and wrote to support. AITOC responded within an hour and was able to get my problem resolved almost immediately. I bought this module. It came with 2 PDFs. One giving you step by step installation guide, the other a user guide for the module. The module didn't work first time when I installed it on my staging server, I think I messed up copying some of the files, but after contacting Aitoc support, they reinstalled the module. And once I restored my database it worked perfectly. Very quick response to support questions. When in deployed it to my production server, it installed flawlessly first time. No issues whatsoever. The module works exactly how I expected it would. It shows Pre-Order and an availability date next to any products I set as pre order. It even works on configurable products if one if on pre order and another isn;t. Really well coded module. I have no regrets after buying it. Am sure my client will also be very impressed with it. Especially as I can send him the user manual and don't have to give him video training this time. Reward Magento customers for remaining your clients or spending big within a certain period of time. Assign a coupon or a discount rule to a hand-picked group of customers in Magento.